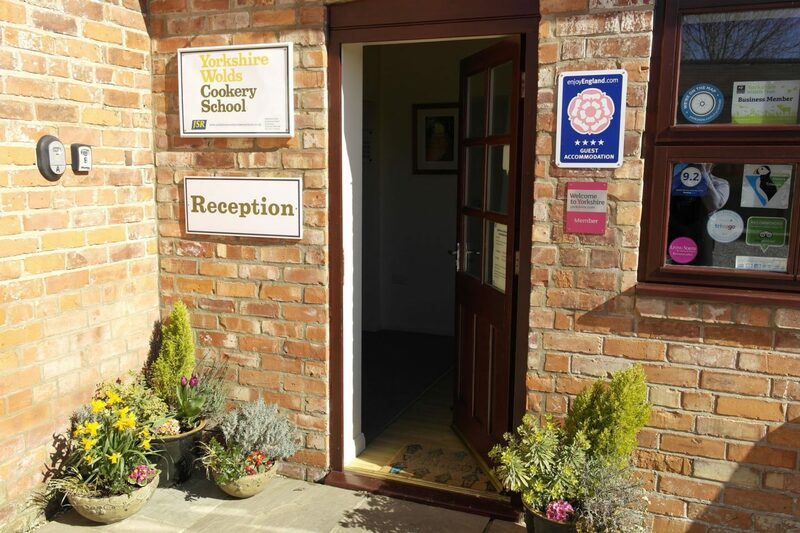 As the name might suggest the Cookery School is set in the picturesque Yorkshire Wolds, near to Driffield in East Yorkshire and has been running since 2010. 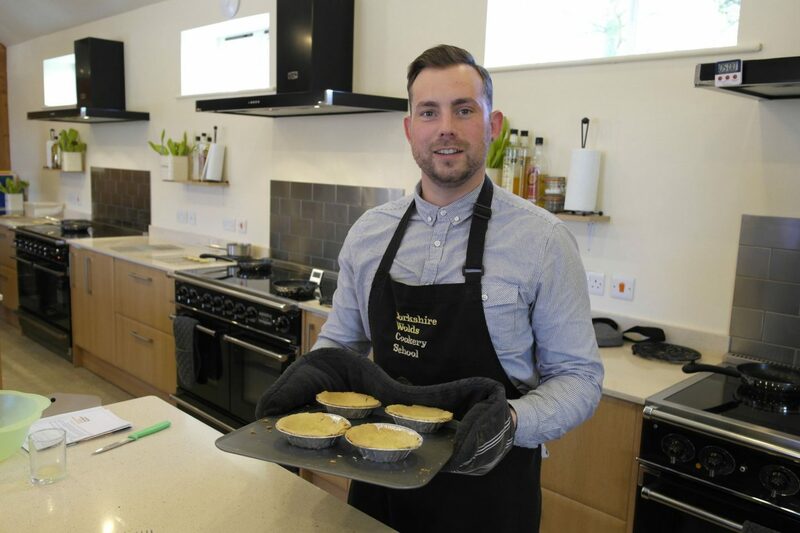 They offer a wide range of cookery courses from Michelin star cooking with James Mackenzie of the Pipe and Glass (which is on my Restaurant wishlist 2017) to the very fitting ‘Yorkshire born and bred’ class, which focuses on seasonal local produce. 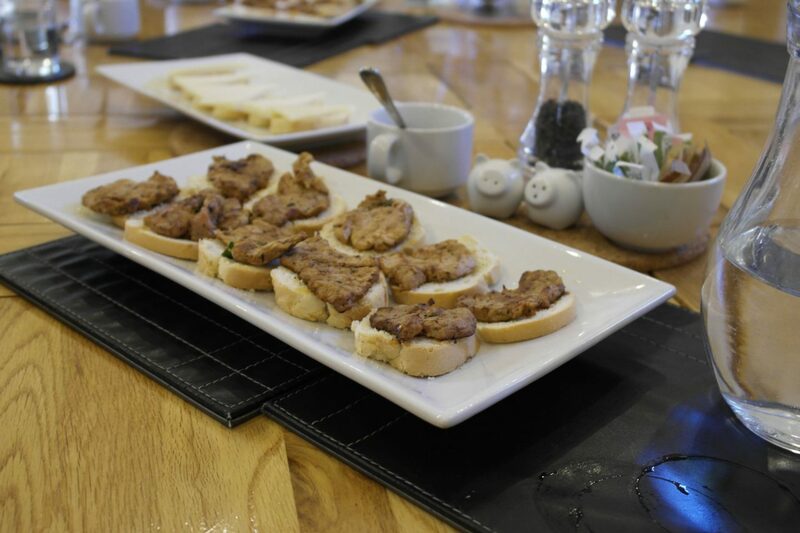 The morning started with tea and coffee in the lounge and an introduction to the Tapas course by our tutor, Ali who’s very familiar with the Spanish style of cooking having previously lived in Spain. 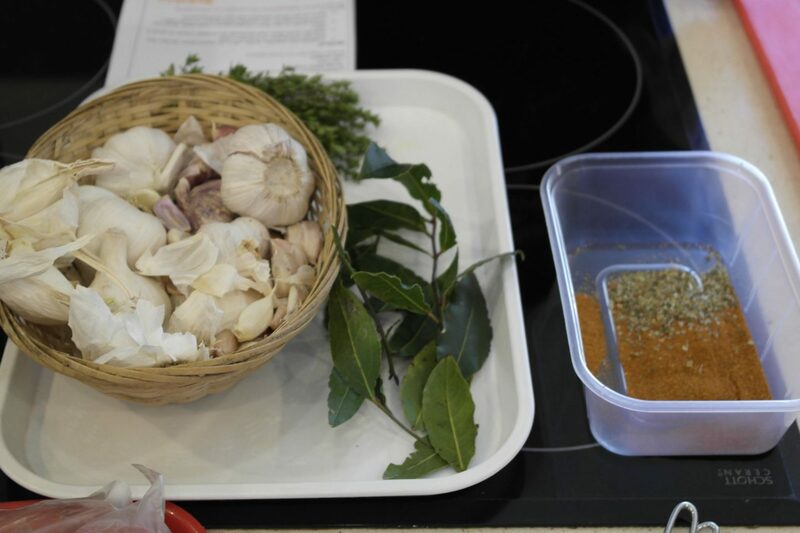 Ali talked us through the order of the day and the dishes we’d be cooking, they all sounded delicious and I was quite intrigued by the blue cheese and anchovy tartlets, which is what we’d be making first! 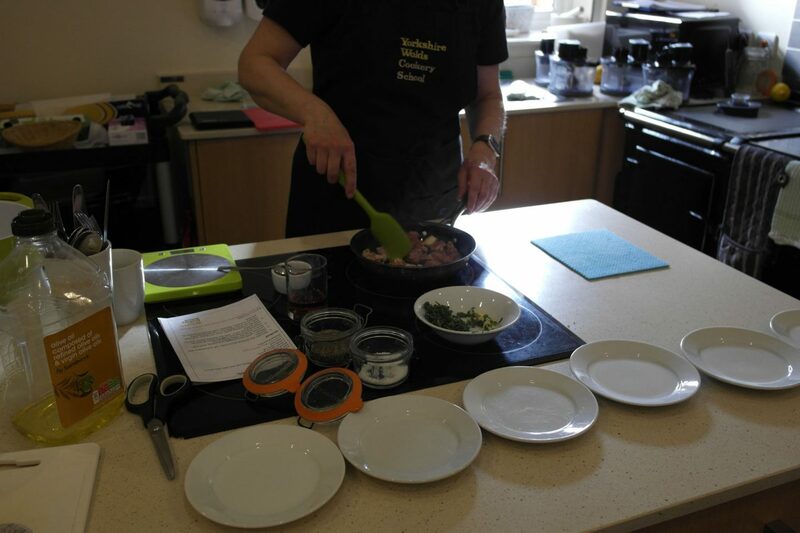 So it was off into the kitchen we went to begin our Spanish inspired cookery course. The class for the day had 6 participants, including myself, meaning one to one time with the course tutor would be maximised. 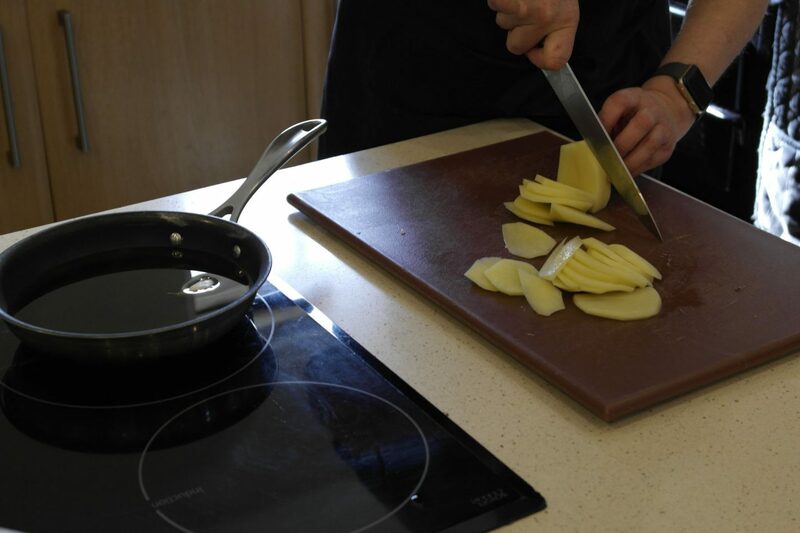 Ali gave us a quick walk through the kitchen and the equipment we’d be using including the induction hobs, that cook in super quick time! 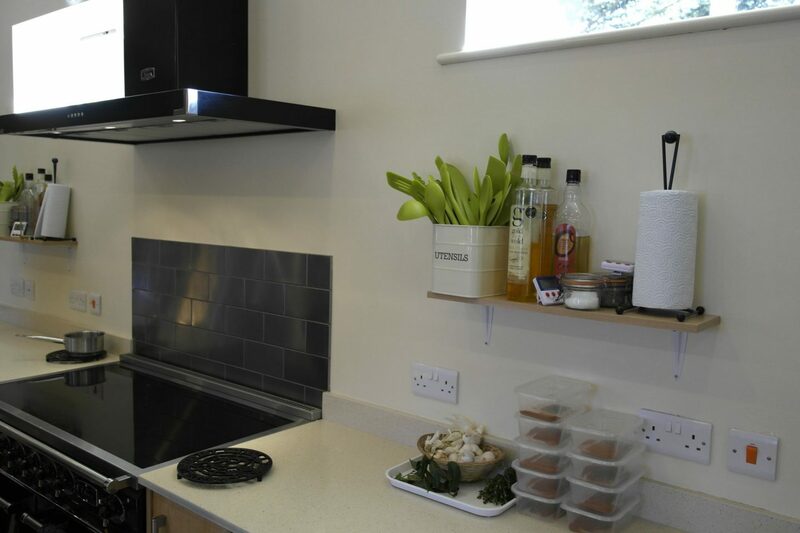 The kitchen is designed to be laid out similar to a domestic kitchen to make you feel at ease. We all popped on our aprons and gathered round the demonstration bench to watch Ali talk us through the first dish. 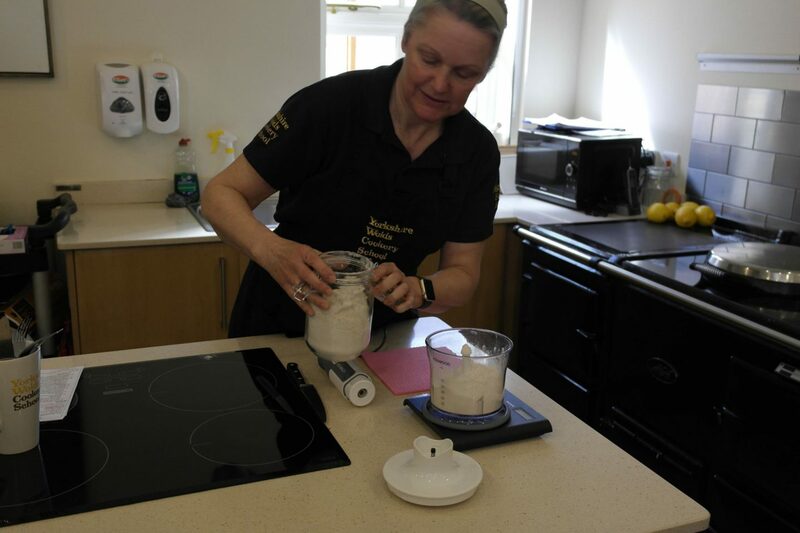 We started off with a demonstration on how to make the pastry for the blue cheese and anchovy tarts. The steps were easy to follow and Ali made it all look so easy! Then it was over to us! Thank god for the mini food processor which made light work of combining the butter and flour. Once combined with the egg and rolled out, it was into the cases ready for the oven. 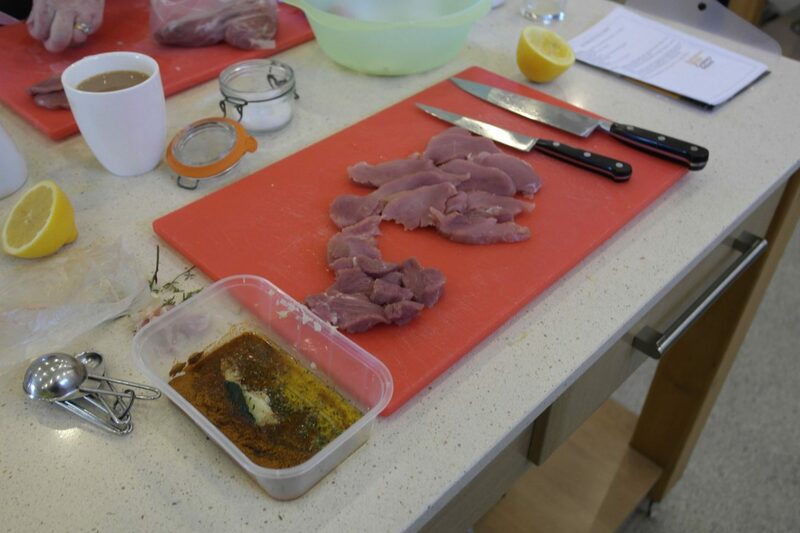 Back at the demo area, Ali showed us how to prepare the montaditos de lomo en adobo a very tasty looking marinated pork fillet dish. Throughout the day I picked up some little tips and tricks like the easiest way to peel a clove of garlic by breaking the clove with the back of a knife and how to crush without using a garlic crusher! 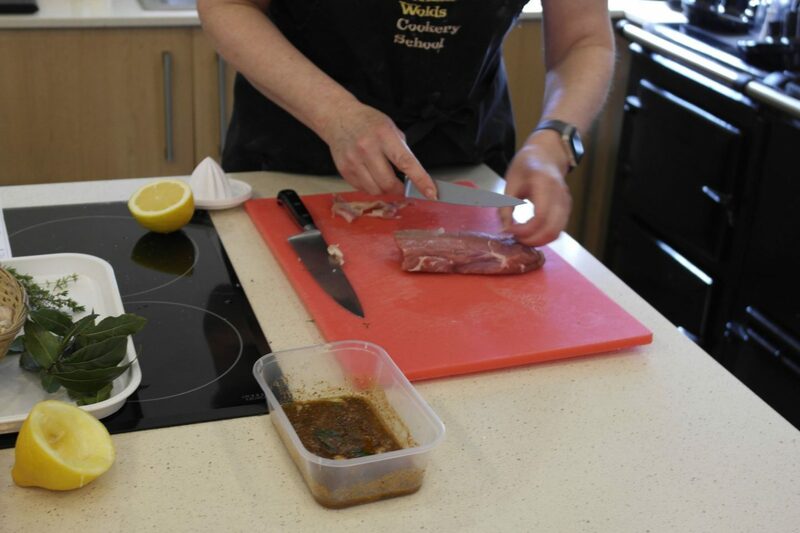 Over to us again to cut up our pork loin and prepare the marinade, garlic being one of the main ingredients of course… Spanish cooking just wouldn’t be the same without it! 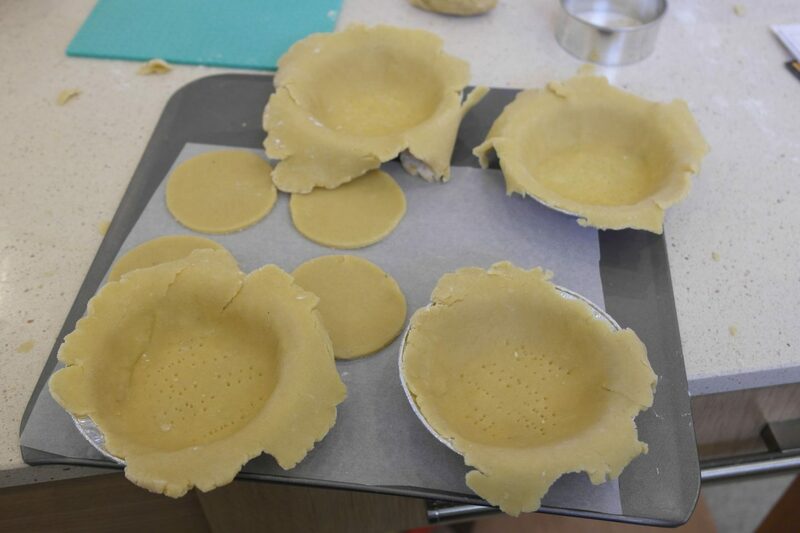 Our tart cases were taken out of the oven after being blind baked, I was quite pleased how they turned out! 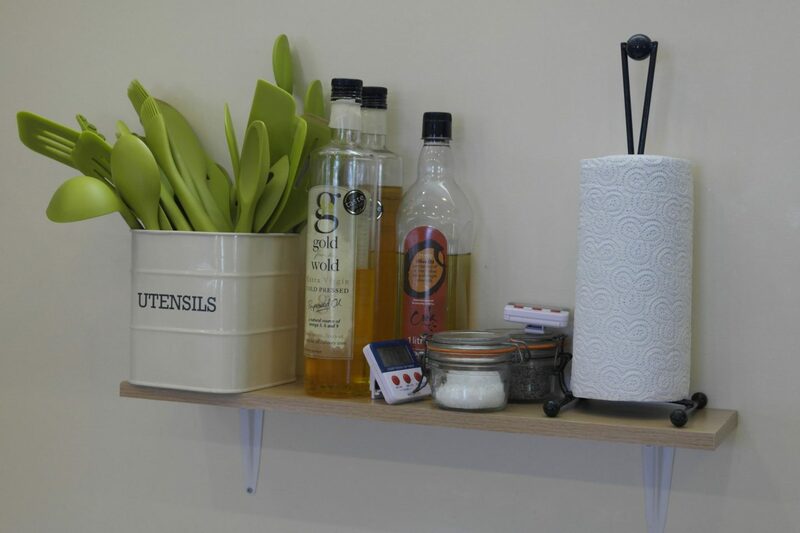 All the equipment we’d used was cleared and washed up for us by the cookery school staff, it felt a little strange not having to do any of the washing up! 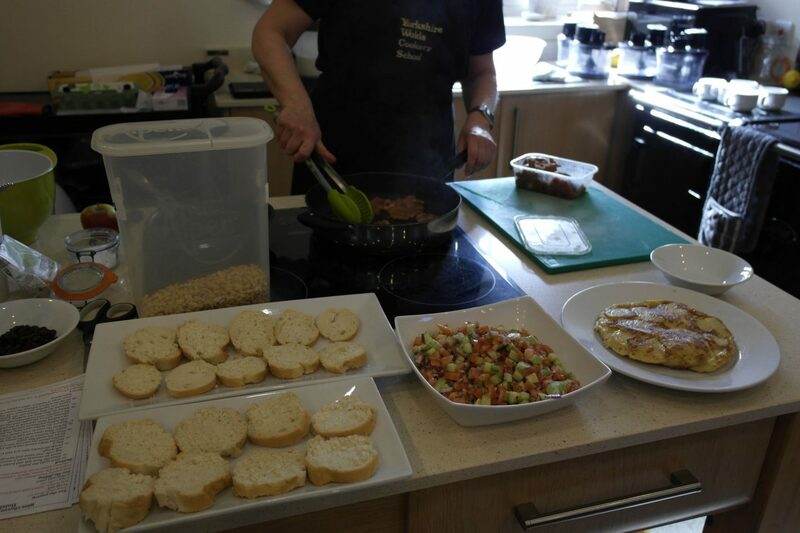 Next up was the tortilla a la espanola or more commonly known as Spanish omelette. 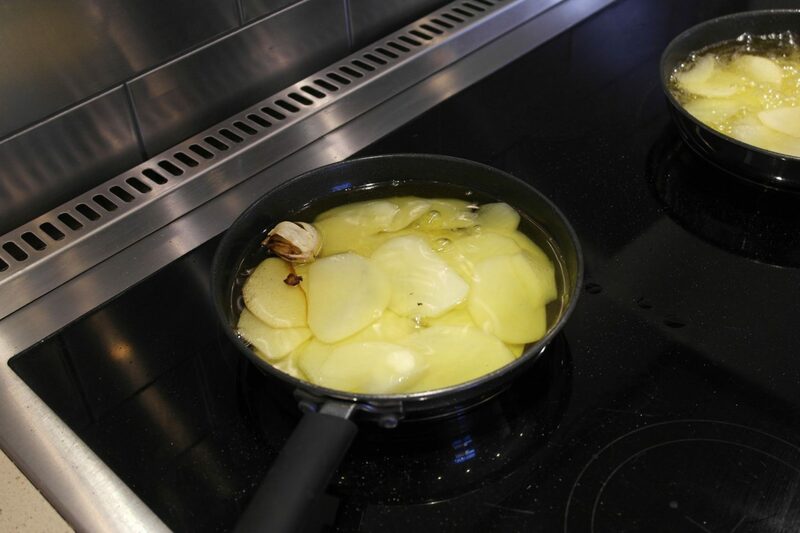 Ali showed us the steps from preparing and slicing the potatoes, simmering in oil and then cooking the omelette in easy to follow steps. 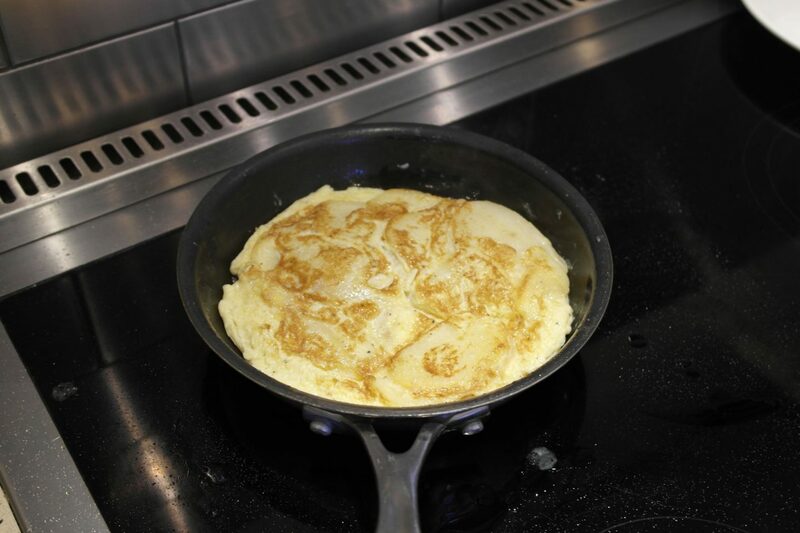 This is actually the first Spanish omelette I’d made, I was really pleased how it turned out! And it tasted really good too! I think we were all quite hungry by this point. For lunch Ali cooked some of the marinated pork loin for us to have with a traditional Spanish salad and also ajo blanco, a Spanish cold soup made from bread, crushed almonds, garlic (what else)! and olive oil. 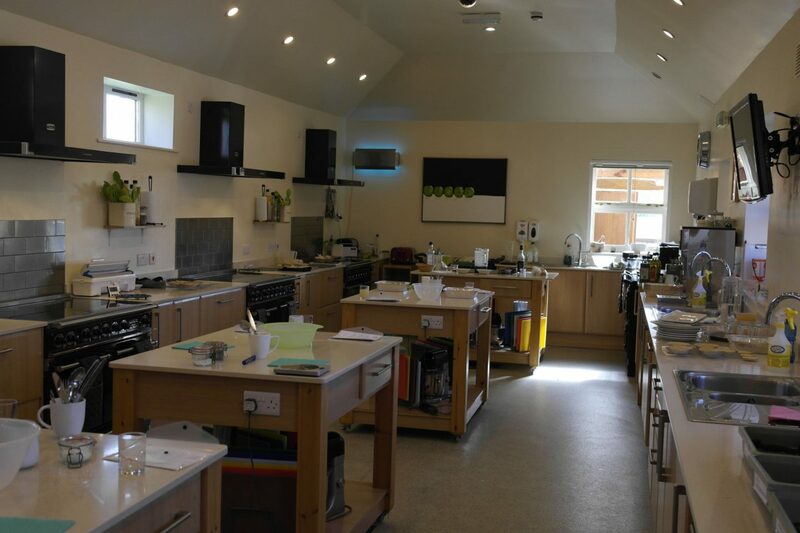 We had lunch in the cookery school’s impressive dining room. 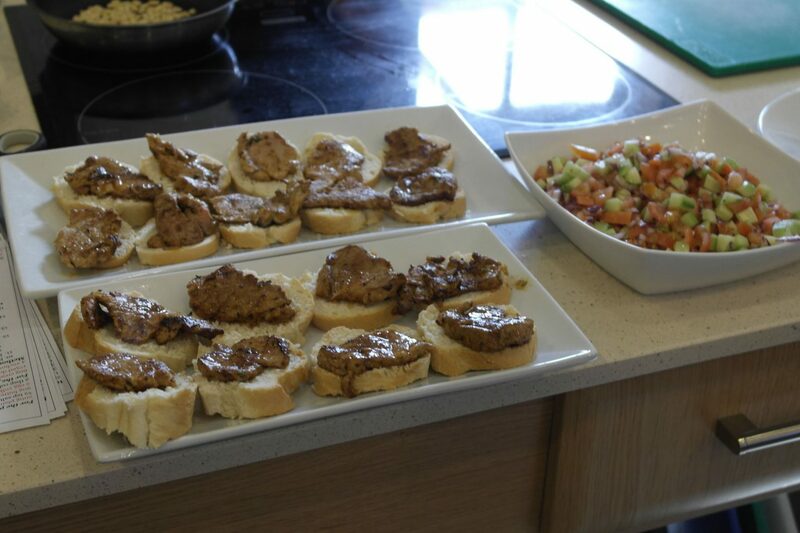 The marinated pork was delicious and the salad went so well with the simple but tasty tomato, cucumber and red onion salad. 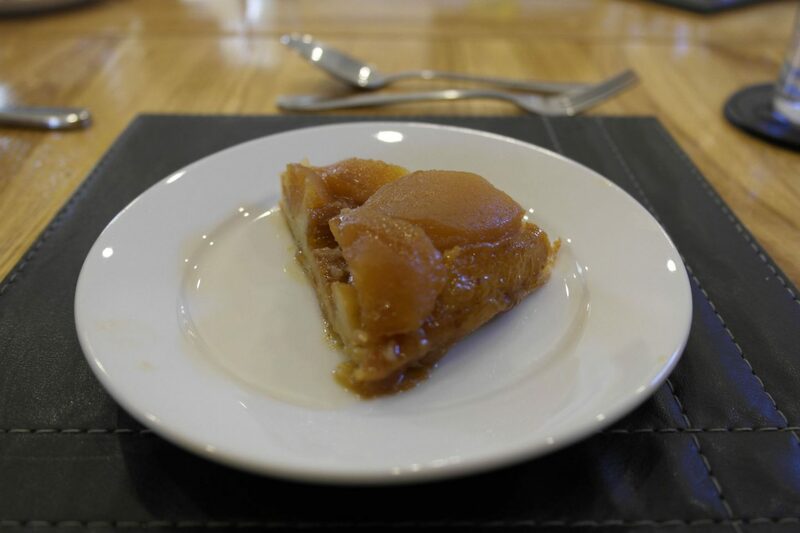 For dessert, we had apple tart, which had been made in the cookery class the day before. I can honestly say it was an amazingly good apple tart! 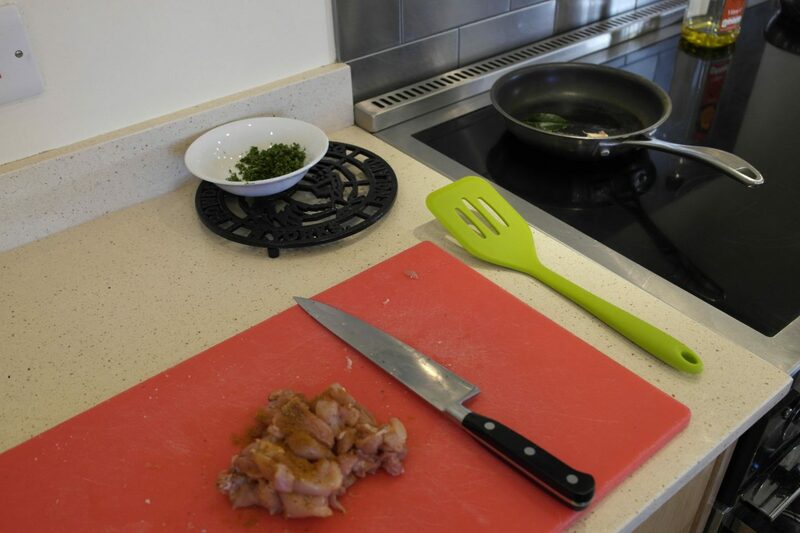 After lunch it was back to the demonstration bench for the final two parts, preparation of the pollo al ajillo, chicken thighs with paprika, garlic and parsley and the blue cheese filling for the tarts. 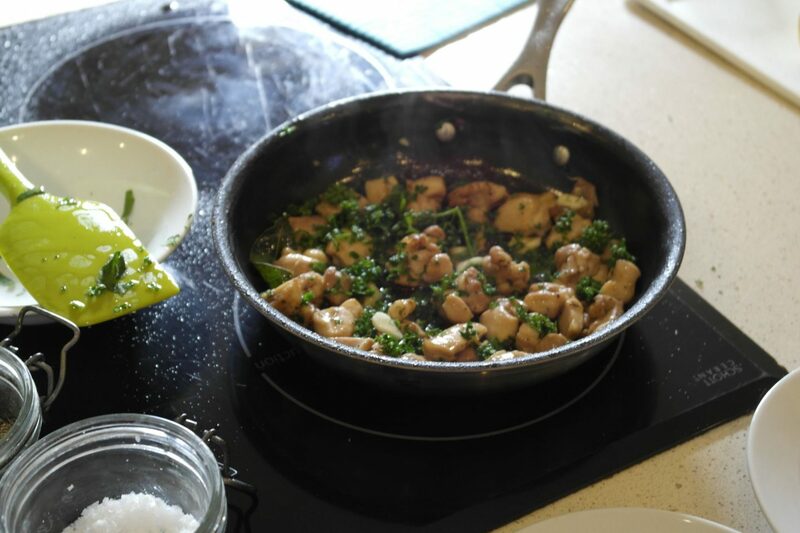 Then it was back over to us, the chicken dish was relatively easy to prepare, the chopping of the parsley was probably the trickiest part, making sure it was chopped fine enough! The blue cheese filling was made by whisking double cream until it holds it’s shape then adding crushed bits of creamy blue cheese. 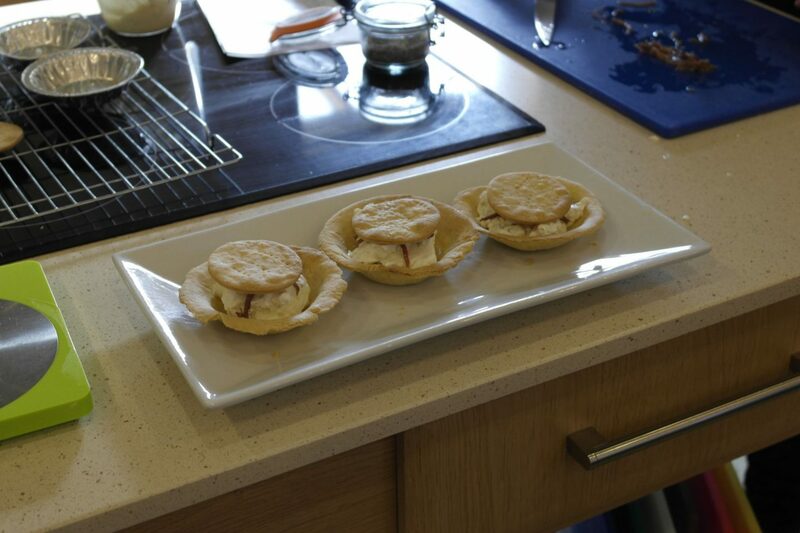 The filling is then added to the tart cases and thin strips of anchovy are added to the top. I was a bit unsure of the anchovy at first, but the salty flavour was perfectly balanced with the blue cheese filling. This was definitely my favourite dish of the day! 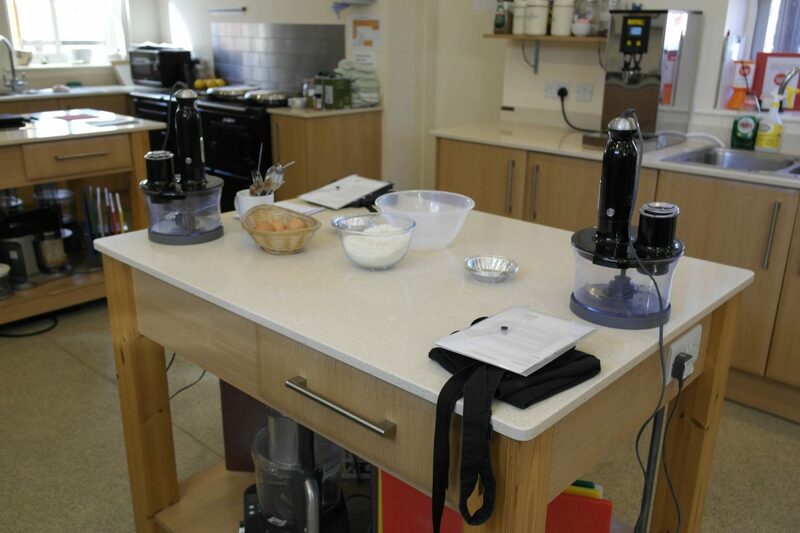 I had a really enjoyable day at the Cookery school and can’t wait to try out the recipes and others at home. 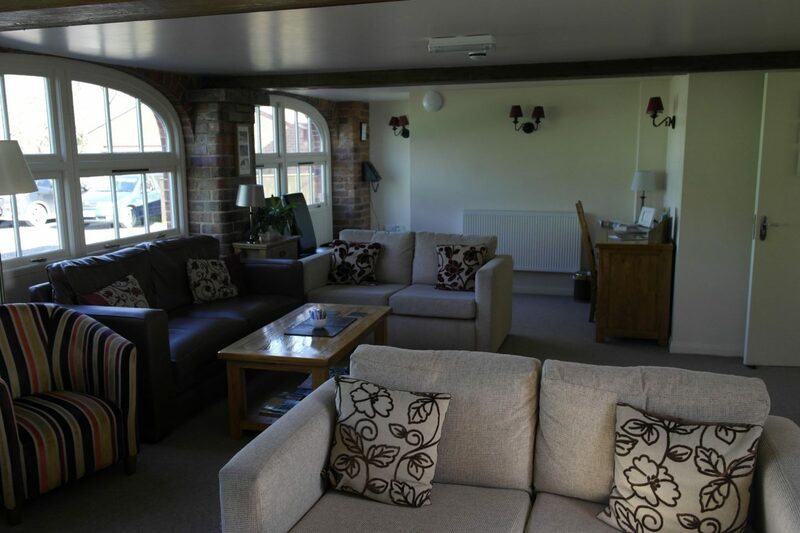 The steps throughout the day were really easy to follow and the tutor is always on hand to give help and advice. 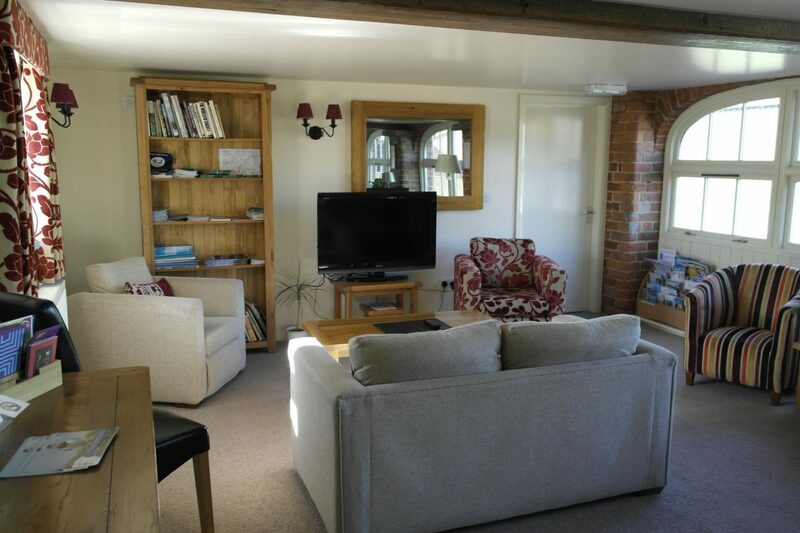 The best part is you get to take everything you’ve made home with you and all the clearing and washing up is done for you! 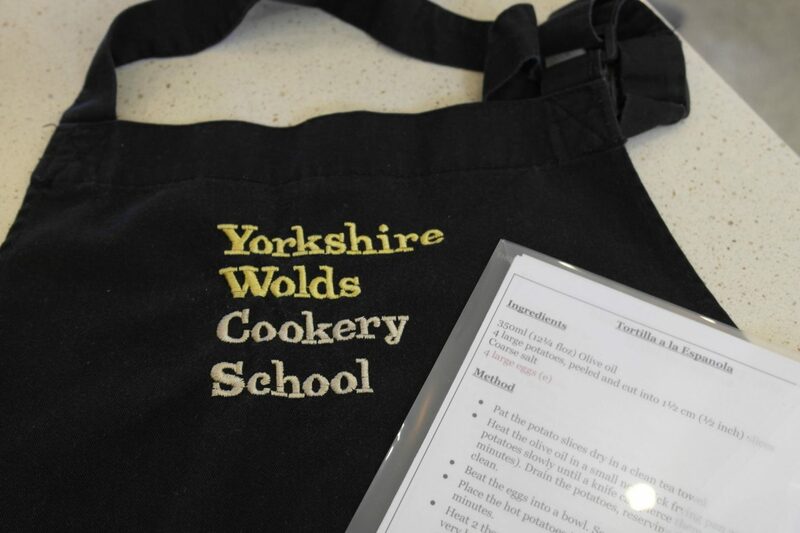 Thank you to Yorkshire Wolds Cookery School for inviting me along for the day. 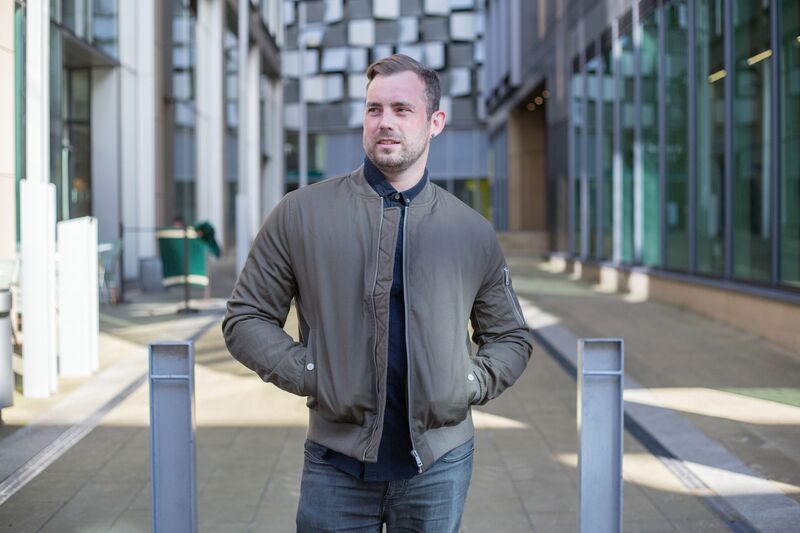 I’d certainly return for the ‘Yorkshire born and bred’ course! 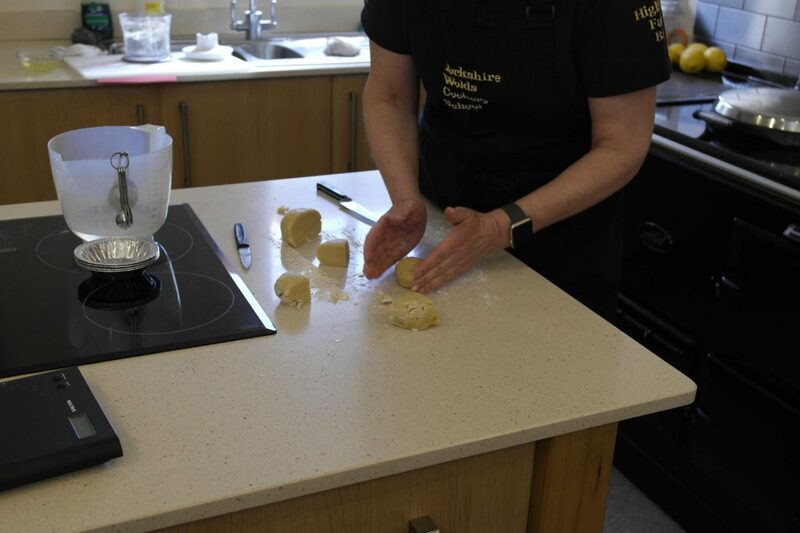 Have you been on a cookery course? 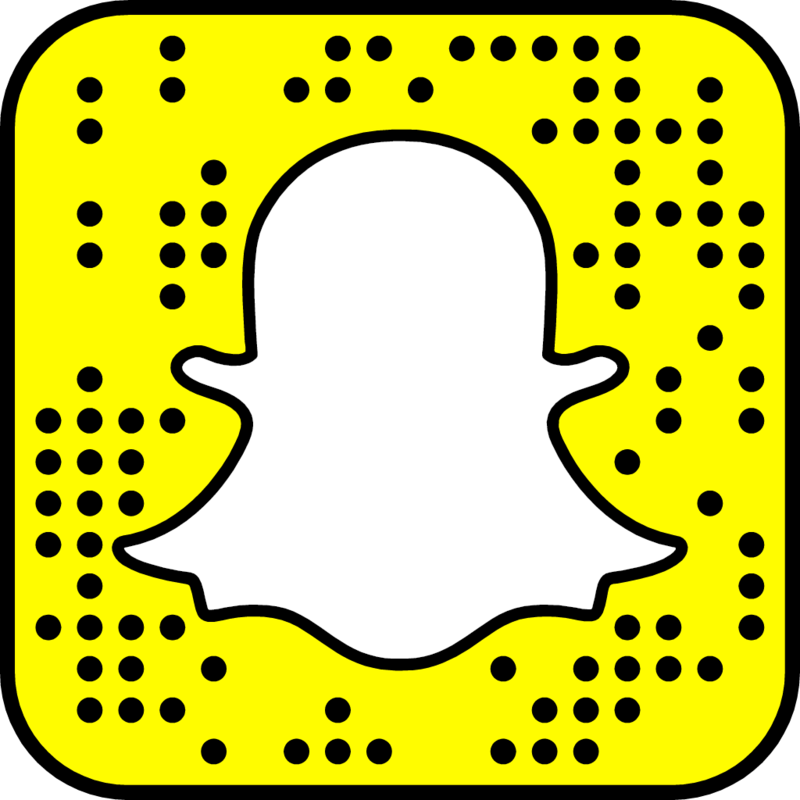 Let me know how it went using the comments box below. *Course was complimentary for review purposes. All views and opinions are my own. 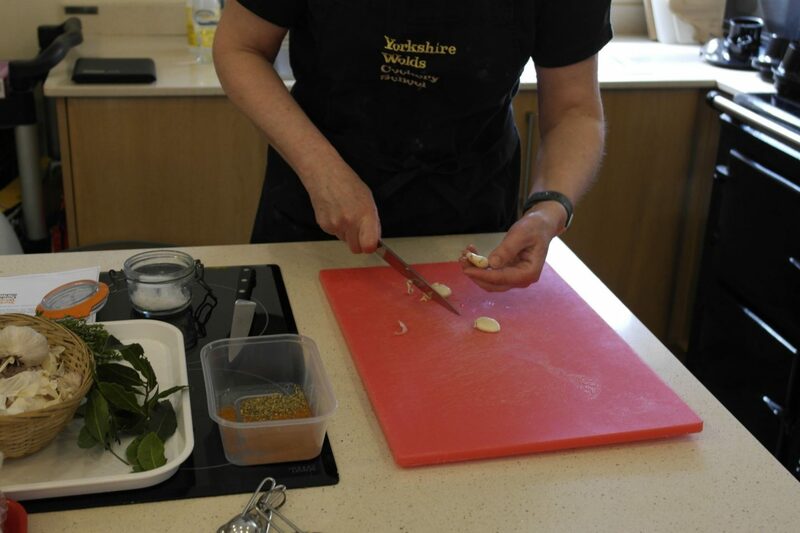 I’ve not been on a cookery course before, but would love to do one like this, love tapas and would love to learn how to make a proper tortilla – didn’t know you had to simmer the slices in oil like that!